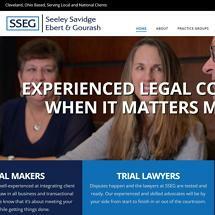 Originally established in 1978, the Seeley Savidge Ebert & Gourash Co., LPA, law firm in Westlake, Ohio, has proudly served the residents and businesses of Northeast Ohio for nearly 40 years. Since that time, we have grown to become one of the largest and most respected full-service legal practices in the region by delivering the exceptional counsel and effective representation our clients need for all of their important and pressing legal challenges. Handling a wide range of legal areas, the attorneys at our law firm possess decades of combined legal experience among them to help you achieve the most favorable outcome possible for your specific situation. As deal makers, we can help you resolve your disputes and reach agreements without the need for expensive and protracted courtroom battles; however, as highly rated trial attorneys, we will fight on your behalf in court when necessary to protect your rights and best interests while helping you secure the positive results you seek. In all cases, we are problem-solvers, and we will use every tool at our disposal to devise the innovative, customized solutions you deserve. Whether your legal issue relates to your business, your family, your freedom or your future, you can trust the legal professionals at Seeley Savidge Ebert & Gourash Co., LPA, for unmatched assistance and support. To find out more about the services we offer and how we can best serve your needs, you can contact our law office to schedule a free initial consultation. North American Insurance Speciality, Inc.